Mobile POS applications are hard to implement without the proper printer. The mobile printer PB31 from Intermec may be used flexibly in the most varying of applications, thanks to its maximum media width of 84 mm. 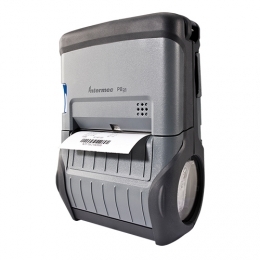 Whether printing sales slips, packing slips or invoices, this robust direct thermal printer delivers results quickly up to 102 mm/sec., cleanly 203 dpi and reliably. Various sensors provide continuously current status and error messages on the practical LCD display. Thus, it excellently supports mobile processes in logistics and transportation facilities, as well as in retail. High maximum print speed of 102 mm/sec. In combination with the optional magnetic stripe reader it is also possible to process cashless transactions. Connect the PB31 standard via USB or RS232 with a corresponding mobile computer. For a wireless option there are also Wi-Fi and Bluetooth variants available. Its robust housing reliably protects the PB31, even from drops onto concrete from heights up to 1.5 m. Additionally it is protected against moisture and dust IP54 certification, as well as extreme temperatures. Not even vibrations interrupt operation. Therefore, operation in vehicles and on forklifts is also possible.